With Nepal’s towering Himalayas and ages-old temples, it’s no surprise that so many people have this small South Asian country on their travel bucket list. Between its dozens of treks, Buddhist and Hindu religious sites, and delicious food, travelers young and old fall in love with Nepal each year. That’s not to mention that supporting tourism in Nepal is more important than ever, as Nepalis try to recover from the devastating earthquakes of spring 2015. Before you hop on the first plane you can to Kathmandu, though, it’s important to think about what you’ll put in your backpack. I’ve lived in Nepal for eight months now, and I definitely wish I had packed a little differently before moving here. To help you out, here’s a list of packing essentials for Nepal, as well as what you should buy or rent there, what you should leave at home, and answers to some FAQs about traveling in this amazing country. 1) Passport – This may seem obvious, but don’t lose your passport! This is your ticket in and out of Nepal. Bring along some photocopies of your main passport page too, just in case. 2) Guidebook for Nepal – Lonely Planet’s guidebook to Nepal provides an excellent overview of different places to explore in the country, as well as essays on social and cultural norms, a few useful Nepali phrases, and tons of hotel and restaurant recommendations. A guidebook is a really great way to learn more about the country you’re visiting, and it can help orient you when you’re feeling lost. 3) Camera and charger – You may have heard about a little old mountain range called the Himalayas. Chances are that you’ll get some mountain views during your visit, and you’ll want to have a camera at the ready to make sure you capture the scenery. Coming in at just over one pound, the Canon EOS Rebel Digital T5 is a good option for beginning photographers who still want quality photos. Alternatively, you can take some pretty great photos with an iPhone these days— use whatever you’re comfortable with! 4) Cell phone and charger – Bring your cell phone with you, especially if you know that it’s unlocked (Verizon phones, for example, are generally unlocked). SIM cards in Nepal cost less than $1.50, and data is also relatively inexpensive. If you think being able to make calls and have data will be useful, I definitely recommend that you purchase a SIM! 5) Travel insurance – Travel insurance is important for anyone going overseas, since many domestic insurers won’t cover certain essentials— say, being evacuated by helicopter at 4,000 meters. Think about what sort of activities you’ll be partaking of, and make sure that whatever policy you buy will cover you. World Nomads offers excellent, affordable, and flexible travel insurance, so check them out. 6) Water bottle or Camelbak – My Camelbak water sack has come in handy countless times during my travels in Nepal. It’s important to carry potable water with you, and I love that the Camelbak allows me to drink water without having to fuss with a bottle. That said, many people prefer water bottles! In any case, make sure you bring something to carry at least one liter of water around with you. 7) Water purification tablets or water filter – Nepal does not have potable drinking water (although it’s much worse in urban areas than up in the mountains), so it’s important that you bring along a water filter or purification pills. Bottled water is also readily available, but I would recommend avoiding creating all that plastic waste! 8) Sandals – They might not be the most fashionable shoes, but sports sandals definitely come in handy in Nepal, particularly if you’re traveling during hot weather or the monsoon. You’ll be doing a lot of walking, so you want something comfortable; Kathmandu is also quite dusty, so something that can be cleaned easily is important. 9) Good-quality walking shoes or hiking boots – If you’re going to be trekking, you should bring a pair of hiking boots with you to Nepal. If you’re on a longer-term backpacking trip and don’t want to lug around a pair of giant boots, make sure that you at least have a pair of good-quality sneakers with you. It’s not a good idea to skimp on footwear while you’re trekking— that can mean blisters, or worse, a twisted ankle. 10) Hiking clothing – While it’s possible to buy cheap hiking apparel in Kathmandu, it’s a good idea to bring along at least one outfit that you can wear while hiking. Vapor Apparel offers shirts with built in sunscreen and moisture wicking. Make sure that whatever clothing you bring is comfortable, loose (Nepalis dress fairly conservatively) and covers your shoulders and knees! 11) Non-hiking clothing – When you’re back from your trek, you’re going to want to explore the sights and sounds of Pokhara, Kathmandu, or whatever other place you’re visiting. Nepalis avoid dressing shabbily, and few wear athletic clothing on the street. You probably won’t need anything fancy, but I would recommend bringing one reasonably modest and nice outfit that you can wear out. 12) Rain jacket – Bring a windbreaker/rain jacket to keep you warm and dry, particularly if you’re hiking between May and October, when it rains more consistently. This one from the North Face comes in plenty of bright colors, so it’s easier to spot you when you’re trekking! (People in Nepal also tend to wear very bright colors, so you’ll fit right in). 13) Credit and debit card – While Nepal is a primarily cash-based society, ATMs are regularly available in Kathmandu, Pokhara, and other large towns. Bring a credit or debit card so you can withdraw cash when you’re in urban centers; that way, you’ll be able to pay in remote areas (which certainly do not accept Visa, Mastercard, or any other type of plastic). 14) Money belt – While petty thievery is not rampant in Nepal, it does happen. Protect yourself and your belongings by wearing a money belt, which you can use to conceal cash and important documents like your passport. This particular belt also protects you from thieves who might try to scan your card electronically! 15) Solid shampoo and soap – Solid shampoo and soap are a great travel alternative to liquid washes, since you don’t have to pack a bottle and they can’t spill. 16) Travel towel – Who wants to lug around a full sized towel in their backpack? I certainly don’t. A travel towel, which is much more compact than a regular towel, is a good choice for those trying to minimize the size of their backpack. This one, from Buena Marca, is nearly full-sized and comes with its own carrying case. 17) Power adapter – Nepal uses plugs from India, Europe, and the United States, so it’s a good idea to bring a converter along with you to make sure you’re able to charge all of your devices without any trouble. 18) Personal medications – It should go without saying that you should bring any prescription medication you use with you to Nepal. While certain pharmaceuticals are readily available at the small pharmacies commonly found in Kathmandu, others are not. 19) Basic first-aid kit – Bring a travel first aid kit with you in case you get into a (literal) scrape. This particular one from AAA is compact, lightweight, and contains everything you need to treat common ailments. You may want to stick some painkillers, antibiotics, diarrhea pills, and altitude sickness pills (all available at local pharmacies) in there as well for when you go trekking. 20) Hiking backpack – Although it’s possible to rent a backpack in Kathmandu or Pokhara, if you’re planning on doing more trekking or hiking, it may be worth purchasing one. A good backpack is a worthy investment! I have an Osprey backpack and I love it— especially their lifetime warranty on all of their products. 21) Contact solution – It’s possible to purchase cheap Indian-brand contact solution in Kathmandu, or even to hunt down some American brands, but I would recommend skipping the chase and just bringing your own good-quality stuff if you wear contacts. It can be quite dusty in Kathmandu, so you’ll want to make sure that you’re cleaning your contacts regularly. 22) Sunscreen – It’s likely that you’ll be spending a lot of time outdoors during your stay in Nepal, and it’s important to make sure that your skin doesn’t get burned. I like Neutrogena’s sunscreen because it’s creamy without being greasy, and at 85 SPF provides pretty strong protection. It is possible to buy sunscreen in Nepal, but you may not be able to find higher-quality brands. 23) Bug spray – If you’re traveling to Nepal in warmer weather or plan on going to the Tarai region at any point in the year, bring some bug repellent. People have different opinions on using DEET on your skin, but I try to avoid it if possible! 24) Power bank – Until recently, power outages (referred to in Nepal as ‘loadshedding’) were very common, particularly in Kathmandu. As of writing in mid-2017, power outages are infrequent, but it’s still a good idea to keep your devices charged and to carry around a power bank just in case. 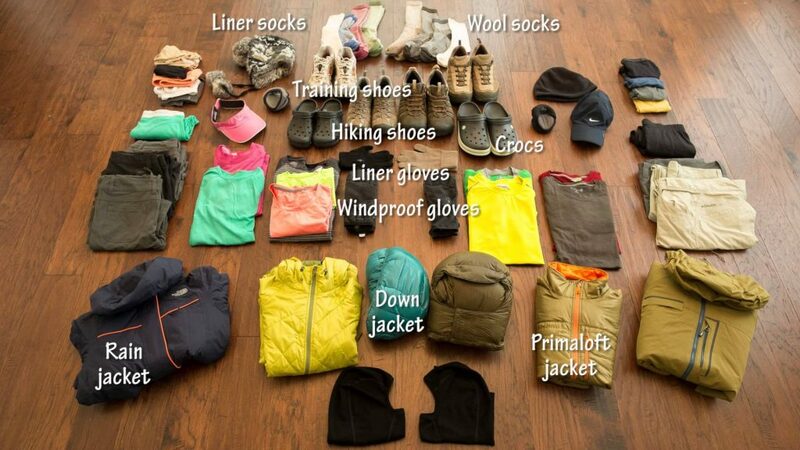 Planning on trekking? There are certain items that are much easier to buy or rent in Thamel once you’ve arrived rather than schlep all the way from your place of origin. In terms of style of dress, responsible travelers will note that Nepal is a culturally conservative country. Even in relatively cosmopolitan Kathmandu, men and women cover their shoulders and knees. Avoid tight, revealing clothing. For women, the color red is quite popular— wear it if you want to blend in a little more! Open-toed shoes that dry quickly are recommended for the monsoon. If you’re trekking, you’ll want to bring good quality hiking shoes. Cheap shoes are easy to purchase in Kathmandu and other larger cities and towns, but the large-footed among us should know that it can be quite hard to find properly sized footwear. 1) 🚫 Expensive, unnecessary electronics: Unless you ABSOLUTELY NEED to travel with your $1000 laptop, your $200 headphones, and/or your $800 iPad, leave them at home! The risk of losing these items or having them stolen most likely far outweighs any benefit you’ll get from traveling with them. Consider buying a cheap tablet if you really must travel with an extra screen besides your phone. 2) 🚫 Expensive jewelry: Again, the risk of having valuable jewelry stolen far probably outweighs the pleasure of wearing it while traveling. If you’re missing your jewels, check out Kathmandu’s shops; there’s quite a lot of nice jewelry available, and for fairly cheap prices. 3) 🚫 Hardcover or expensive books: Kathmandu’s book stores are plentiful, so if you’re itching for something to read, go visit one! 4) 🚫 Revealing or tight clothing: In Nepal, people generally cover up much more than folks in the States, Europe, and Australia do. Leave your tank tops, shorts, and miniskirts at home. 5) 🚫 A towel: A full-sized towel is bulky and unnecessary. Bring a travel towel instead! 6) 🚫 A sleeping bag: Unless you have an ultra-light, compact bag, rent a sleeping bag for your trek in Thamel (Kathmandu’s tourist neighborhood). It will cost you about $1 per day, and that way you don’t have to lug a big sleeping bag all the way from home. 7) 🚫 A down parka: Again, unless you have an ultra compact jacket, you may as well rent one in Thamel. This will also cost you about $1 per day. 8) 🚫 Leather: Nepal is a predominantly Hindu country, and observant Hindus do not consume beef or wear leather products since the cow is a sacred animal. Wearing leather products on the street should be fine, but one should not wear leather products into temples. 9) 🚫 Lots of cash: Carrying around cash in Nepal is inevitable, since one can rarely use cards. You’ll also often have to pay for your treks/other trips with cash, which means that you will most likely be exchanging/withdrawing large amounts of money. However, as with anywhere else, be prudent about how much you carry with you! In Nepali, the word for food is khaanaa— which is also used to describe dal bhat, or lentils and rice, the staple food in Nepal. Most Nepalis eat dal bhat twice a day, and you should make sure to partake of this hearty, delicious dish while you’re in the country. Momos, a Tibetan dumpling, is another local favorite. Vegetarians will find many options. Kathmandu has a variety of international cafes and restaurants, and you can easily find good quality cuisines from all around the world (with one glaring exception; where’s my Mexican food at?). Trekking tea houses have a standard menu of dal bhat and other carb-heavy specials like pasta, chow mein, and pizza. In villages, you’ll be limited largely to dal bhat and chow mein. In Kathmandu, most people speak at least a bit of English, and most people employed in the tourism sector speak English as well. Private schools are often English language, while public (government) schools conduct their lessons in Nepali. You’ll find that younger, middle-class Nepalis are almost always basic conversational in English. Your budget in Nepal will vary greatly depending on the way you travel. A budget trekker traveling alone will pay about $30 USD per day for a guide, plus about $20 USD per day for food and accommodations. In Kathmandu, you can find a decent guesthouse in Thamel for $10 USD a night. A meal in an international restaurant costs about $4-$8 USD; a local meal can be had for as little as $2. Local buses around Kathmandu are about 20 cents per ride; a taxi ride across the city at rush hour, however, can be as much as $6. Admission to the biggest temples in Kathmandu is anywhere between $2 and $15. A solo traveler in Kathmandu who wants to enjoy the sights, travel by taxi, and eat at international restaurants should budget approximately $40 per day, but that can easily be cut down by eating at cheaper restaurants, avoiding the more expensive temples, and taking public transportation. Flights are much more expensive (and much faster) than travel by bus, so consider your budget and schedule and plan accordingly. For example, traveling from Kathmandu to Pokhara is $8 and takes about 8 hours on a tourist bus; flying costs $100, but takes only 25 minutes. Whatever you decide, I do not recommend traveling at night nor on crowded buses. Most foreigners last heard about Nepal because of the catastrophic earthquakes that shook the country in April and May 2015. Nepal, which has the second-lowest GDP in Asia ($1,300), was devastated by the quakes, which killed 9,000, injured 22,000, and displaced 3.5 million. The earthquakes also destroyed priceless centuries-old temples and other religious sites. Two years later, the country is still very much in the process of recovery, with millions still living in corrugated metal shacks. Fewer foreigners know about the tumultuous politics of Nepal, which is still in the early years of its democracy. A good place to start learning about current events is the Nepali Times (nepalitimes.com), an English language newspaper published weekly in Kathmandu. Forget Kathmandu by Manjushree Thapa provides a fascinating look into Nepal’s political history, particularly the civil war that killed an estimated 13,000 people between 1996 and 2006. For most passport holders, tourist visas for 15, 30, or 90 days ($25 USD, $40, and $100) can be acquired upon arrival at Tribhuvan Airport in Kathmandu or at Kakadvitta, Birgunj, Bhairahawa, Nepalgunj, and Gaddachowki on the India-Nepal border. Indian nationals do not a visa to enter Nepal. The tourist visa can be extended, for $2 USD per day, for up to 150 days in a calendar year. Wifi is readily available in Kathmandu, Pokhara, and most other larger towns, and even smaller towns oftentimes have cell phone service. It’s unlikely that you’ll have wifi or cell phone service while trekking, however. I recommend buying a SIM card upon arriving in Nepal, so you don’t have to depend on wifi to communicate! As with anywhere, it’s best to take the lead of the locals. Remember that Nepali culture may be more conservative than the one you grew up with, so observe and ask questions. For example, it is unusual for Nepali couples to touch in public (some younger couples in Kathmandu will hold hands, but even that is not very common). However, friends of the same gender will often link arms or hold hands on the street.